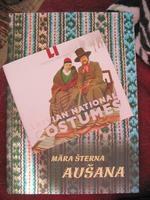 What did I buy from Riga? Well, not much, but enough to fill also Jussi's bag with some of it. He did say that his bag was half empty! Also, what a better way there would be to protect the souvenir bottles of Riga Black Balsam but to squeeze them into soft balls of yarn? I got two books, or one book and one leaflet. Then I bought some sale yarn from the Filati shop. I really did not know what to buy even though the yarn was cheap! Maybe it was the language barrier, you had to ask for more yarn in some cases and only one of the saleswomen spoke a little English. It could have been also the yarns were the same as in the Filati shop in Tallinn, so I didn't find anything that new and interesting even though everything was nice and lovely. 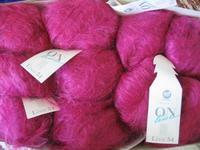 Here's what I got: on the left some ONline Shaba mohair (30% wool, 70% kid mohair) in lovely pink for 0,39 lats a ball. I will be sooooo cute! ONline Shaba in turqoise or petrol (I got some odd balls of this). 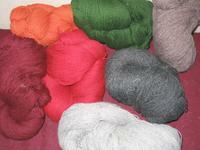 ONline Taiga (100% wool), there's enough of it for a sweater, the price was 0,79 lats a ball. There's another ball of Taiga in the bottom left corner, too. Italian Fashion lurex yarn (50% polyamide, 50% lurex), I just had to buy one ball for a little over a lat but I have no idea of what to do with it. 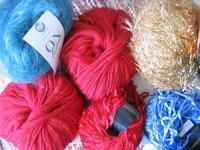 Lana Grossa Velvet (90% viscose, 10% polyamide), some blue and two red balls. I just couldn't resist the red colour! I also forgot the price, but it wasn't that much because there were only few balls left and they were also on sale.